Support for democracy is widespread in the predominantly Muslim countries surveyed. Majorities or pluralities in the seven nations say democracy is preferable to any other kind of government, and many increasingly believe that a democratic government, rather than a strong leader, can best solve national problems. When asked to choose between a good democracy and a strong economy, however, reactions are more mixed. In Turkey, Egypt and Lebanon, opinions are nearly evenly divided, while in Jordan, the Palestinian territories, Pakistan and Indonesia, far more prioritize a strong economy over a good democracy. And while majorities in almost all of the Muslim countries surveyed say freedom of speech, free elections, gender equality, and religious freedom are very important in a democracy, at least as many, and often more, prioritize economic prosperity and political stability. Views of religion-based laws and Islamic fundamentalism vary considerably across the countries surveyed. Majorities in Pakistan, Jordan and Egypt believe that laws should strictly follow the teachings of the Quran; in Indonesia and Turkey, majorities or pluralities say laws should follow the values and principles of Islam – but not strictly follow the teachings of the Quran. 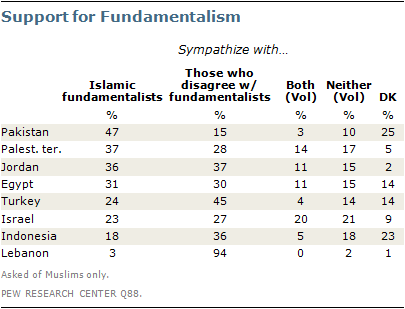 Muslim respondents in Pakistan and the Palestinian territories say they sympathize more with Islamic fundamentalists rather than with those who disagree with them; in Lebanon, Turkey and Indonesia, more say they sympathize with those who disagree with fundamentalists. Opinions are about evenly divided on this question among Muslims in Jordan, Egypt and Israel. Majorities in six of the seven predominantly Muslim countries surveyed say that democracy is preferable to any other kind of government. About eight-in-ten (81%) in Lebanon and about seven-in-ten in Jordan (72%) and Egypt (71%) share this view, as do somewhat smaller majorities in Turkey (66%), the Palestinian territories (64%) and Indonesia (58%). Pakistan is the only Muslim country surveyed where fewer than half (46%) say democracy is preferable. Still, more choose democracy than say that, in some circumstances, non-democratic governments can be preferable (19%) or that, for someone like them, the kind of government Pakistan has does not matter (17%); about one-in-five (18%) do not offer an opinion. In Turkey, however, support for democracy has waned since 2010. About two-thirds (66%) now say democracy is preferable to any other kind of government, compared with 76% a year ago; and the percentage saying that, in some circumstances, a non-democratic government can be preferable has more than tripled, from 6% in 2010 to 21% in the current survey. Support for democracy also has declined somewhat in Indonesia, where 58% now express a preference for democratic governance, down from 64% a year ago. 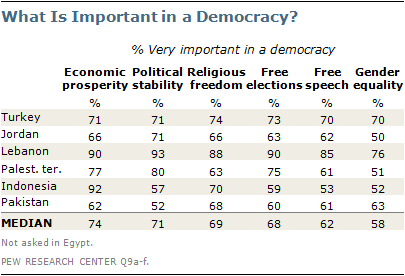 In Turkey, Jordan, Lebanon, Indonesia, Pakistan and the Palestinian territories, at least half say freedom of speech, free elections, gender equality and religious freedom are very important in a democracy, but solid majorities also say economic prosperity and political stability are high priorities. In fact, looking across these six publics, the median percentage rating economic prosperity and political stability as very important in a democracy is higher than the median percentage giving a similar rating to each of the other four items, which are more commonly associated with democratic governance (Egyptians were asked a different version of this question). Respondents in Lebanon are more likely than those in the other six nations to rate each of the items tested as very important in a democracy. For example, nine-in-ten in that country say free elections are very important, compared with 75% in the Palestinian territories, 73% in Turkey, 63% in Jordan, 60% in Pakistan and 59% in Indonesia. Gender equality is generally seen as a lower priority than the other items tested, and this is especially the case in Jordan, the Palestinian territories and Lebanon. While half of Jordanians say it is very important in a democracy that women have the same rights as men, 71% see political stability as a high priority and at least six-in-ten say the same about economic prosperity (66%), religious freedom (66%), free elections (63%) and freedom of speech (62%). Similarly, 51% of Palestinians consider gender equality to be of high importance in a democracy, compared with at least three-quarters who say this about political stability (80%), economic prosperity (77%) and free elections (75%) and about six-in-ten who rate religious freedom (63%) and free speech (61%) as very important. And while a 76% majority in Lebanon say it is very important in a democracy that women have the same rights as men, even more say this about the other five items tested. Majorities in six of the seven largely Muslim countries surveyed say democracy, rather than a strong leader, can best solve their country’s problems. 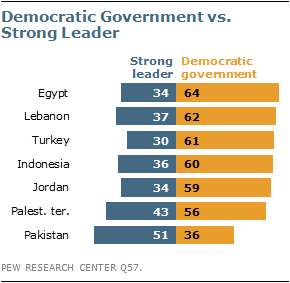 At least six-in-ten in Egypt (64%), Lebanon (62%), Turkey (61%) and Indonesia (60%) say their country should rely on a democratic government, as do 59% in Jordan and 56% in the Palestinian territories. Pakistan is the only Muslim country surveyed where more express support for a strong leader over a democratic government; 51% of Pakistanis say their country should rely on a strong leader, while just 36% say democracy can better solve national problems. Support for democracy over a strong leader is considerably more widespread than it was in 2007, when the question was last asked. 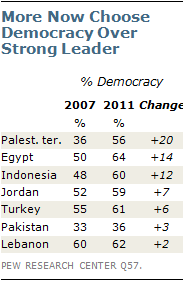 This is especially the case in the Palestinian territories, where the percentage saying a democratic form of government is preferable to a strong leader is up 20 points, from 36% in 2007; double-digit increases are also evident in Egypt (14 percentage points) and Indonesia (12 points), while more modest but significant increases occurred in Jordan (7 points) and Turkey (6 points). When asked to choose between a good democracy and a strong economy, opinions are mixed across the seven Muslim nations surveyed. About half in Turkey (48%), Egypt (47%) and Lebanon (47%) say a good democracy is more important; about the same percentage (46%, 49% and 51%, respectively) prioritize a strong economy. 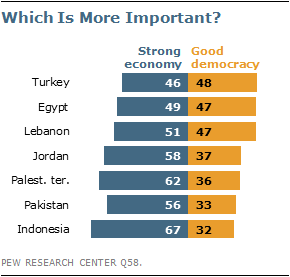 In Jordan, the Palestinian territories, Pakistan and Indonesia, however, majorities say a strong economy is more important than a good democracy. Indonesians are about twice as likely to choose a strong economy (67%) as they are to choose a good democracy (32%). About six-in-ten Palestinians (62%) and Jordanians (58%) also prefer economic prosperity, as do 56% of Pakistanis; at least one-third in each country say a good democracy is preferable (36%, 37% and 33%, respectively). Support for a good democracy over a strong economy has increased somewhat in recent years. 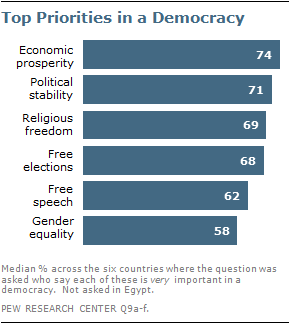 For example, while opinions are now nearly evenly divided in Turkey and Egypt, the balance of opinion was clearly in favor of economic prosperity in 2007; 53% of Egyptians and 49% of Turks said a strong economy was more important, while 42% and 41%, respectively, chose a good democracy in 2007. And in Indonesia, an even larger majority prioritized a strong economy (77%) over a good democracy (21%) in 2007 than is the case today. Lebanese Christians and Sunnis are considerably more likely than Shia Muslims in that country to prioritize democracy over a strong leader and a strong economy. About seven-in-ten (72%) Sunni Muslims and 64% of Christians in Lebanon say a democratic government can best solve their country’s problems; in contrast, just 45% of Shia express support for a good democracy over a strong leader (55%). Similarly, while Lebanese Sunnis and Christians are about evenly divided when asked whether a good democracy or a strong economy is more important, a majority of Shia prioritize economic prosperity. 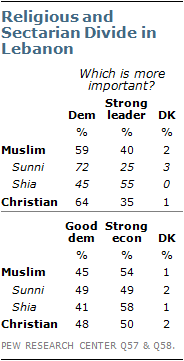 About half of Sunnis (49%) and Christians (48%) say a good democracy is more important; about the same share (49% and 50%, respectively) choose a strong economy. Among Shia Muslims in Lebanon, 41% prefer a good democracy, while about six-in-ten (58%) believe a strong economy is more important. Views about the role of Islam in the legal arena are mixed across the seven predominantly Muslim countries surveyed. Support for laws that strictly follow the teachings of the Quran is widespread in Pakistan (78%), Jordan (70%) and Egypt (62%). In contrast, just 36% of Palestinians, and even fewer in Indonesia (26%), Lebanon (20%) and Turkey (8%), share this view. In Indonesia, a majority (56%) believes laws should follow the values and principles of Islam but not strictly follow the teachings of the Quran, as do a plurality in Turkey (45%) and sizeable minorities in the Palestinian territories (30%) and Lebanon (36%). A substantial percentage in Turkey and Lebanon say laws should not be influenced by the teachings of the Quran (34% and 37%, respectively); fewer than one-in-seven in the five other Muslim nations surveyed offer this opinion. In Lebanon, views of religion-based laws vary across religious and sectarian groups. Shia Muslims express the most support for laws that strictly follow the teachings of the Quran; 35% offer this view, compared with 20% of Sunnis and just 8% of Christians. Four-in-ten Sunni and 43% of Shia Muslims say laws should follow the values and principles of Islam, as do 27% of Christians. Most Christians in Lebanon (53%) say laws should not be influenced by the teachings of the Quran; about one-third (32%) of Sunnis and 21% of Shia share this view. Opinions about the role of Islamic fundamentalism are mixed across the Muslim publics surveyed. In Pakistan, about half of Muslims (47%) say they tend to sympathize more with Islamic fundamentalists in their country, while just 15% sympathize more with those who disagree with fundamentalists; about four-in-ten (38%) do not choose a side. More Muslims also express support for Islamic fundamentalists than for those who disagree with them in the Palestinian territories (37% vs. 28%). In Jordan and Egypt, opinions are nearly evenly divided. Among Jordanian Muslims, 36% sympathize more with Islamic fundamentalists and 37% sympathize with those who disagree with fundamentalists; in Egypt, 31% of Muslims express support for Islamic fundamentalists and 30% side with those who disagree with fundamentalists. Opinions are also somewhat divided in Israel, where 23% of Muslims express support for Islamic fundamentalists while 27% side with those who disagree with them; half of Israeli Muslims do not choose a side. In Lebanon, just 3% of Muslims sympathize with Islamic fundamentalists; more than nine-in-ten (94%) say they sympathize more with those who disagree with fundamentalists. And while about one-quarter of Muslims in Turkey (24%) and 18% in Indonesia say they sympathize with Islamic fundamentalists, far more express support for those who disagree with them (45% and 36%, respectively).